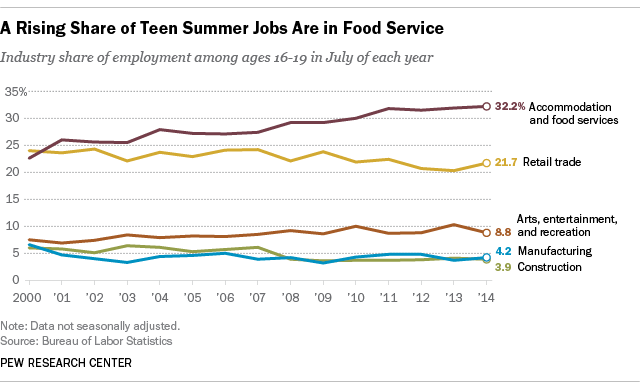 Far fewer U.S. teens are working during the summer compared with years past, as we reported last month. But it turns out that teens who are finding work these days are more likely to be busing tables or tending a grill than staffing a mall boutique or T-shirt stand. To get a sense of the kinds of jobs teens are working and how that’s changed, we looked at Bureau of Labor Statistics data from July 2000 through July 2014. (Pre-2000 data aren’t comparable.) One trend jumped out immediately: a dropoff in teens working retail. Up modestly was the “arts, entertainment and recreation” sector, in which 8.8% of employed teens worked last July, versus 7.5% in 2000. But manufacturing and construction both were down, to 4.2% and 3.9%, respectively, of teen summer employment. A combined 450,000 teens worked in manufacturing or construction last July, less than half the combined number in July 2000. What about this summer? Last month, 32.1% of 16- to 19-year-olds, or 5.3 million, were employed overall, suggesting the continuation of a modest upward trend that started in 2011. But nearly 1.5 million were counted as unemployed, meaning they were available and actively searching for work but had not yet found any. And far more – 9.84 million, or 59.2% of the total civilian non-institutional population of 16- to 19-year-olds – were not in the labor force at all, meaning they were neither employed nor actively looking for work. In June 2000, by contrast, only 6.3 million teens (39.8% of the total age group) were outside the labor force entirely; those numbers surged during the Great Recession and have yet to go down very much.